Another hot weather summer salad for you. I made this salad, along with the Grilled Bread and Tomato Salad for friends over the holiday weekend. It’s quick, simple, uses mostly fresh ingredients (with the exception of dried currants and canned chickpeas) and was very refreshing and delicious! I found this recipe in a cookbook that I love called Clean Food. The book is written by a woman named Terry Walters, a fellow blogger, author and cook who believes in “eating clean and living well.” The book showcases recipes for the best of all seasons… it’s broken out into Spring, Summer, Winter and Fall and for each season, provides delicious recipes using ingredients you should be able to find through local farmer’s markets or at other whole/clean foods markets. She’s also somewhat local — she lives in CT… so show her a little link love! You can actually find a few of the recipes from this cookbook on her website. 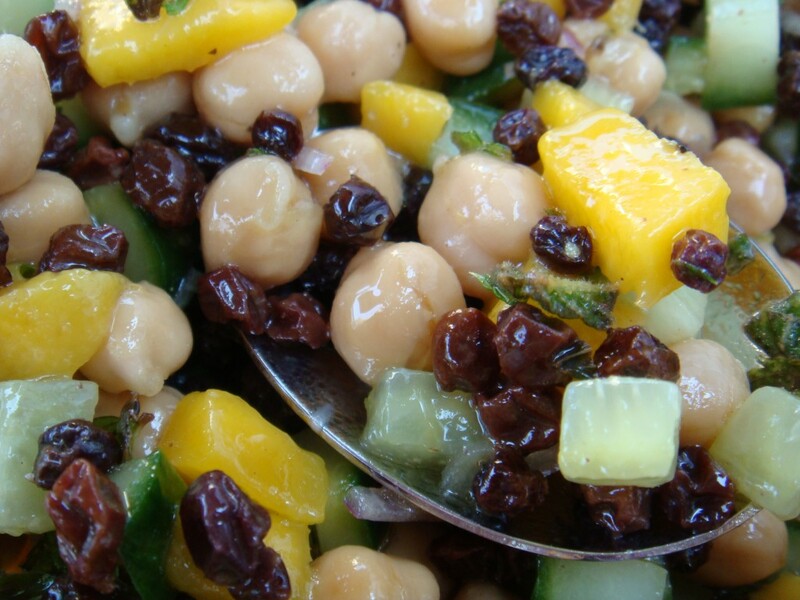 In a large bowl, combine cucumbers, mango, chickpeas, currants, apricots and mint. In a separate bowl, whisk together all dressing ingredients. Pour over salad, toss and serve. I really liked this salad… and so did the rest of my guests. Even our friend’s 2-year old downed it! Tonight, I ate the leftovers with some teriyaki-marinated grilled chicken. I diced up the cold chicken (also a left over) and tossed it with the remaining salad. It was great!